"I hope you enjoy your new home." Velwyn wears a set of middle class clothing: a burgundy linen shirt, burgundy linens and a pair of thick cowhide shoes. He is armed with a shortsword that will be the best quality for your level and also carries a cheese wedge and a small amount of gold. Velwyn's room is located on the floor above the taproom, first door on the left, and he sleeps there every night between midnight and 6am. After waking up he spends the entire day relaxing with innkeeper Wilbur and the other regulars, only interrupted by a two-hour lunch at 12pm. 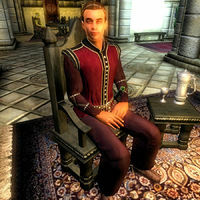 Meanwhile, in downtown Anvil, the citizens will discuss Velwyn and his estate: "I heard that Velwyn Benirus is trying to sell off Benirus Manor. Hopefully the new owners will clean that eyesore up." and "I swear that when I passed by Benirus Manor last night, I heard someone scream from inside. Velwyn Benirus will never sell that deathtrap!" When you ask around, they will point you towards the inn: "That layabout? You can find him wasting time at The Count's Arms." When you finally track him down at the inn, Velwyn will skip all unnecessary introductions and get right to business: "You wouldn't happen to be in the market for a home would you? If you are, I just happen to be selling a manor located right here in Anvil." If you inquire further, he will explain: "Yes, I'm selling my grandfather's house, Benirus Manor. If you're interested, I could let you have it for a modest sum. I have to sell it soon, as I have pressing matters elsewhere. You're welcome to take a look at it. It is located across the street from the Chapel. Once you buy, you get the key to the front door and the deed of ownership. That's the deal. Would you like to buy it now?" If you decline his offer, he will say: "Well, I'll be here every day from noon until midnight. Let me know if you change your mind." When approached later on he will inform you his offer still stands: "That manor is still for sale if you're interested." If you choose to hand him the 5000 gold, he will exchange the gold with the deed to the manor and the key: "Excellent! Here's the key to the front door and the deed of ownership. I hope you enjoy your new home. Now, if you'll excuse me, I must attend to those pressing matters I spoke of earlier. Good day." He will then rush out the door before you can change your mind. If you manage to catch him, he will just comment: "You got quite a deal on that house." If you ask him about the manor at this point, he will simply cut you off: "You already bought the manor, and I have nothing more to say about it." Velwyn will then take the 30-hour trip to the Imperial City and will book himself in permanently at the King and Queen Tavern in the Elven Gardens District. Here, he will change his daily routines slightly but will still never venture outside. His room is located on the second floor, first door on the right, and he will now add an additional two hours to his usual sleeping time and get out of bed at 8am. He will then head down to the taproom and wander around all day long, only interrupted by a two-hour meal at 1pm, and never even care that he just sold you a haunted house. Back in Anvil, after having spent a night in the company of several unwanted residents, you will have to find Velwyn for an explanation. Once again, the townsfolk will point you towards The Count’s Arms: "I'm not sure where he went, but I would ask at The Count's Arms. If anyone knows where he is, it would be someone there." At the inn, the regulars will say: "As soon as you bought the place, he pretty much up and left. I hear tell he's making his way to the Imperial City." When you ask around in the big city, the citizens will point you towards the tavern in the Gardens: "Yes, he just arrived in town recently. I believe he's staying at The King and Queen Tavern." Others will say: "I believe I heard a Benirus is in town. You should check out the Elven Gardens District. A Benirus wouldn't be seen anywhere else." When you confront him, he will act innocent: "I'm surprised to see you all the way out here in the Imperial City." When asked about the manor, and confronted with the Scrap from Lorgren's Diary, it becomes apparent that he knew what was going on: "So you think I'm responsible? I suppose you're right, as the manor used to belong my grandfather, Lorgren Benirus. I knew there was a curse on that place which is why I sold it to you so cheap. I suppose I should've warned you, but I had to get out of Anvil. 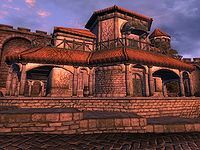 My family said I could move here to the Imperial City once all our loose ends were tied down. The manor was one of those loose ends. I fear my own greed got the better of my judgment. I hope you weren't hurt badly in that horrible place. I suppose I assumed you'd be able to lift the curse and be done with it." He will then proceed to tell you the truth about his grandfather: "Lorgren Benirus was a strange old man, always dabbling and experimenting with magic. He was mostly harmless, until the fateful day he came across a tome bearing the evil magic of necromancy. He became obsessed and decided that by using necromancy, he could prolong his own life. The dark arts contained in the tome called for him to dig up the recently deceased in the nearby crypts under the cathedral. When it was discovered that he did this, the Mages Guild called for a quick meeting to decide what to do. It only took minutes to decide. Led by a young upstart named Carahil, the Mages Guild stormed Benirus Manor and slew Lorgren. However, amid the chaos, his body vanished. Because of this, the people of Anvil concluded the manor must be cursed. You are the first person to set foot inside in a long time." When you ask him to help lift the curse he will accept: "According to the diary entry, it seems that I'm the only one who can open the secret door in the manor. And I can't help feeling slightly guilty selling you the place under these circumstances. I'll meet you in Anvil at The Count's Arms. From there we'll try to lift the curse together." If you forgot to bring the diary entry he will refuse to help you: "I'm sorry; I can't help you with the curse. You bought the house; you'll have to deal with it." In Anvil, he will patiently wait for you to show up and once again change his routines, sleeping from midnight to 6am and enjoy an afternoon meal between 3pm and 5pm. When you approach him, he will say: "I was half expecting you not to show up. Are you ready to go to the manor?" If you say yes, he will lead the way to the manor: "Then let's get this over with. I don't relish the thought of spending too long inside of the manor. Follow me." Once inside, he will ask you to take charge and will then follow you down into the basement: "Okay, you lead from here. Hopefully we can make it to the basement without too much fighting." When asked about the manor at this stage, he will reveal just how scared he is: "This place makes me uneasy. Let's tread wisely and make our way quickly to the basement." When asked about the curse he will say: "I hope that whatever's behind the door will truly lift the curse. I'd hate to risk harm for nothing." He will finish the conversation asking: "Did you hear a noise?" After having opened the sealed portal, he will cowardly run away from the manor, seeking shelter at the usual inn, waiting for you to take care of the rest. Should you talk to him as he makes his escape, he will say: "I'm pleased we were able to get that secret door open, but I fear I can no longer assist you here. I'll wait for you at The Count's Arms." When you confront him after having dealt with Lorgren’s remains, he will say: "I'm sorry for running away like that, but fear got the best of me. I'm glad you talked me into coming with you. Now that the curse has been lifted, I feel like I've taken care of my family's unfinished business. Excellent work, my friend. May the manor give you many years of happiness. I'm now off to the Imperial City once more. Farewell!" 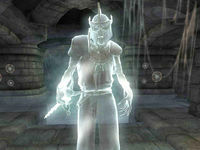 He will then travel back to his life in the Imperial City for the last time. Should you speak to him about the manor again, he will say: "I'm overjoyed to hear that you were able to cleanse the manor. Well done my friend, well done!" On subsequent meetings, he will greet you with: "Enjoy the manor. It suits you well." Once you have broke the curse, people may comment: "The new owner sure has turned Benirus Manor around. It's now a welcome addition to our city."